Today is Mardi Gras. I told Annie lets pretend we are at a parade. So when she sees Mommy she should roll over and show her tummy. Annie did, and Mommy appropriately threw us beads. I was so excited. I just love beads. Annie on the other paw was not so excited. She was hoping Mommy would throw toys. Oh I do think you would love to play with the beads! 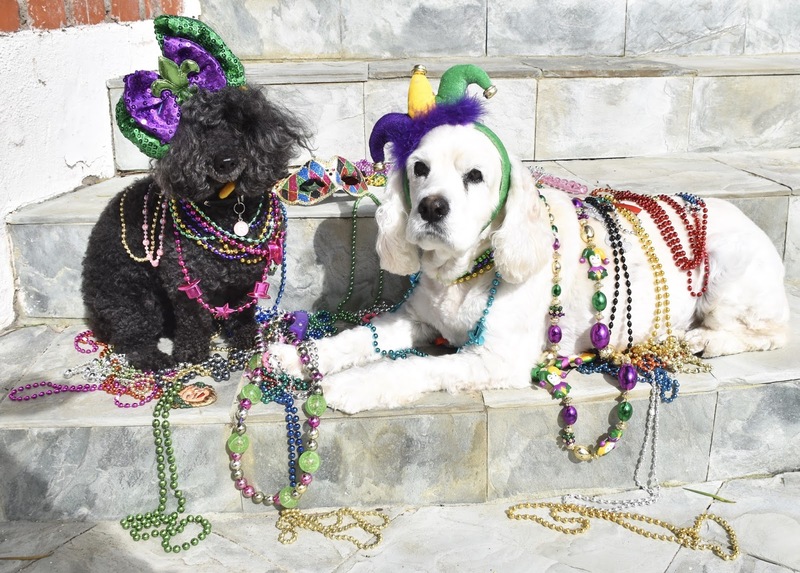 Hope you are getting Mardi Gras treats! RosyPoodleKisses! Happy Fat Tuesday Ladies, all the bakeries in Chicago make Punczki donuts today and people brought them into work. Punczki pronounced POONCH-key are big donuts filled with fruits and other good stuff. Very sweet very popular. We also got a King ring from a bakery in N.O. which bakes a little baby into the cake ring. The person who finds the tiny baby has to buy the King Ring for next year. Happy Mardi Gras ladies....Bosco will happily toss you both some beads. Sounds like so many yummy treats ! Now Annie wants to know why we only got beads ! Happy Mardi Gras!! RosyPoodleKisses!